The Thurstons – the earlier history referred to in the link above explains how John Thurston came to own the property at 57 High Street. Based on his age at his death, John would have been born about 1791. He was the son of Obed Thurston and his wife, Martha, (nee Grove). The IGI reports his marriage to Hannah Parker being on 20th January 1820. John and Hannah had several children: Maria baptised on 5th June 1822, Obed Edward baptised on 4th August 1824, John Horatio baptised on 6th September 1825, Hugh Kingsmill baptised on 11th September 1827 and Henry Neville Cotton baptised on 11th April 1830. The baptism records show all the children baptised at Thornbury and John’s home was in Kington. John died on 15th March 1870 aged 79. He had continued to own the property at 57 High Street until his death and then it was left to his eldest son, Obed Edward Thurston. Obed kept the ownership of the property until his death in 1899. The 1905 Rate Book shows the ownership was still in the hands of Obed’s trustees, but by the 1907 Rate Book Ernest Percy Weatherhead had become the owner. Mary Ann Moore a spinster was mentioned in an indenture of 1813 as a tenant of this property which had been purchased by Ralph Grove. 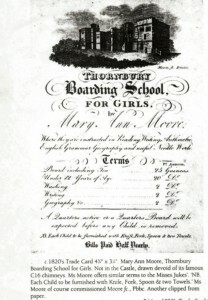 Thornbury Museum has an advert from this period for a boarding school run by Mary Ann Moore. Please click on the thumbnail image on the right to see a photograph of this advertisement. It shows a sketch of Thornbury Castle but it would seem that the school was actually in the building later called 57 High Street. Sadly we have no further information about Miss Moore. 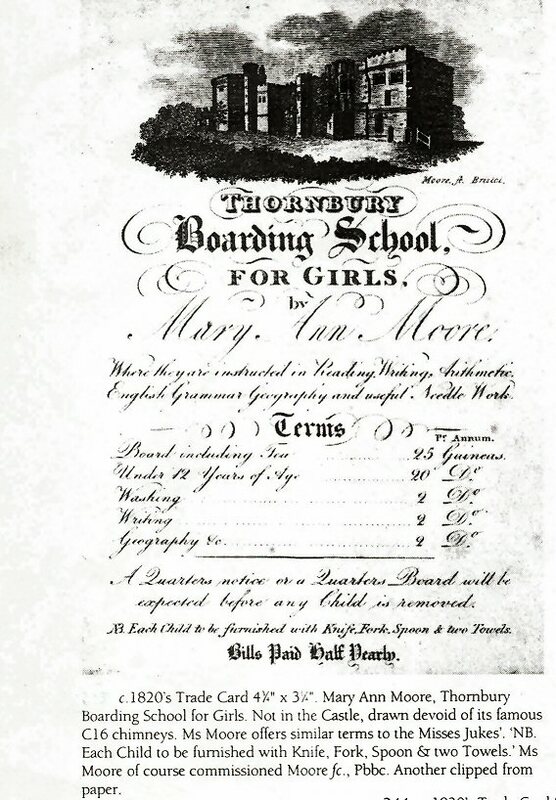 The 1840 Tithe Survey shows that ‘Mrs Wegener’ was renting the property from John Thurston. The 1839 trade directory shows that Maria Wegener ran a boarding and day school for ladies in the High Street, presumably at this property. It is interesting to note a notice printed in the newspaper in 1840 calls Mrs Wegener’s property ‘Thornbury House‘, a name later associated with the home of the Key family at the bottom of Castle Street. We know from the baptism record of her daughter, Agatha Georgiana on 27th May 1827 that Maria was the wife of Frederic Matthew Wegener, a solicitor. According to his age at his death, he was born about 1790. On 17th December 1815 Frederick married Julia Georgina Thomas of Peckham in St Pauls Church, Deptford. A 1815 newspaper also shows his address was Jewry Street, Aldgate in London. Frederick and Julia had a daughter, Elizabeth Ann born on 14th February 1817 and baptised on 13th March 1817. The baptism record shows Frederick was the Vestry Clerk for the parish. Julia died aged 28 and was buried on 2nd May 1820 in Wapping. An entry on the A2A website shows Frederick was an attorney living at 13 Red Lion Street, Wapping in 1820. The Bury and Norwich Post published on July 2nd 1823 has a notice of Frederick’s second marriage. Mr F. M. Wegener, solicitor of Wapping was to marry Miss Abbott of Stratford on 14th July 1823 at West Ham. We note that one of the witnesses at Frederick’s first marriage to Julia had been ‘Marian Abbott’ and we suspect that this is the same person as the one who became his second wife. Frederick and Maria had a son, Frederick Abbott Wegener born on 7th June 1825 and baptised at St John’s Church, Wapping on 6th July 1825. Then in 1827 they had their daughter Agatha Georgiana referred to above. Frederick died and was buried in Wapping on 10th October 1832. He was aged 43. We note that there was also the burial of an unnamed son of Frederick Matthews Wegener on 26th June 1824. On January 16th 1869 the Bristol Mercury had the report of a bigamy case in which Mrs Wegener gave evidence. Her statement tells us something about herself and her school. “I am the widow of a solicitor and live at Wootton under Edge Gloucestershire. In 1837 I kept a boarding school at Thornbury near Bristol and employed as a French master a person named Alexander Victor whom I believed to be a married man. The defendant was introduced to me as his wife. Victor entered into partnership with me and took part in the management of the school. The partnership lasted five quarters and ended about the beginning of 1841 or 1842. The partnership ended because the school did not answer”. The 1841 census shows Maria had moved away from Thornbury and was working as a governess in the house of a clergyman in Easton in Gordano. She was aged 30. By 1851 Maria was running her own school at Wickham Place, Stapleton. Living in the house with her were her two daughters, and six pupils and one servant. Maria was a widow aged 45 and born in Hackney and her daughters were Elizabeth A aged 26 and Agatha aged 22, also both born in Hackney. A newspaper advert of 3rd May 1851 for the sale of the property shows Maria was the tenant of 1 Wickham Place, Stapleton. On 1st 1854 the Bristol Mercury reported the death “on March 24 at Ashley Hill House, Lower Montpelier aged 28 of Frederic Abbott only son of the late F M Wegener esq solicitor of London. The 1861 census shows Maria had given up being a schoolmistress and become a dressmaker. She was visiting Harriett Moulding in Stokes Croft. At the time of the 1871 census Maria was boarding in Sim Lane, Wotton under Edge. She was described as an annuitant. Maria’s death was registered in the Clifton area in 1874. From about 1847 the property became the Beaufort Arms, a licensed hotel. Another pub with that name had been located at what is now known as 67 High Street on the corner of High Street and Chapel Street. This had closed in 1847 and the licence and the name transferred to 57 High Street. By 1887 the building became The Castle Coffee House and Temperance Hotel. A coffee tavern had been opened in the building previously used as Attwells School in St Mary Street. This had been such a success that the organisers looked for larger premises. An agreement was made with Obed Edward Thurston for the use of his premises as the hotel and coffee tavern. Edmund Cullimore bought The Castle Hotel with the intention of providing the Town with a cinema. On 29th January 1919 Edmund paid Ernest Percy Weatherhead £800 for the old Castle Temperance Hotel and Coffee Tavern. The cinema auditorium was erected on the rear part of the property (fronting St Mary Street) and buildings at the front were converted to provide a suitable entrance from the High Street ticket office, tea rooms and other rooms used for storage and social functions. Adjoining the cinema was the ‘Picture House Tea Rooms’ run as a separate venture. From 1921 to the early 1930’s it was managed by Frank Harry Moody and his wife, Louisa Gertrude Moody. They lived on the premises. We note that Frank married Louisa Gertrude Bamfield in Bristol in 1914. They had a son, Kenneth H born in Bristol in December qtr 1917. We are confused by the electoral registers of 1935 and 1938 by the number of people listed as occupying the Picture House Cafe. We know from later electoral registers that there were at least two apartments there so it may be that these people were living in the apartments. In 1935, James Herbert Howard and his wife, Mercy Annie were living there with Annie Eliza Howard who may have been their daughter or James sister. The 1901 census shows James was aged 35 born in Oldham and working as an engineer’s timekeeper at the time. Mercy was aged 26 and born in Newton St Loe near Bath. They were living at 44 Richmond Terrace, Shirehampton. James had married Mercy Ann Cleavely in the Keynsham area in 1898. James died in 1935 aged 69. He is listed in the Cemetery burial record as being retired. He was buried on 24th October 1935. In 1938 only Mercy and Annie are listed in the electoral register. Mercy died at 140 Easton Road, Bristol in 1947. She was aged 72 and buried in Thornbury Cemetery on 12th April 1947. In 1935 Roger George Frederick Bull, Donald Hillman and Beryl Maud Thomlinson were also living there. Of these only Donald Hillman was listed as still living there in 1938, sharing the place with the Howards (see above). In 1941 Douglas married Freda M Silvey in Thornbury. The 1946 electoral register shows Donald and Freda living in High Street, although it doesn’t say specifically that they were still at the Picture House Cafe. Beryl Maud Thomlinson who was born in the Lincoln area in 1907. She is listed in the 1931 electoral register as lodging with John Croome Cullimore when he was at 34 High Street. The 1935 register shows she had moved to Picture House Cafe. Beryl was a biology teacher at Thornbury Grammar School. She left the school at the end of the Summer term in 1936 when she married Roy Luce. The 1950 electoral register shows two couples, presumably living in the apartments, Frederick Norman and Mary Cole and Charles A and Grace A N Vokes. Charles Vokes married Grace A. N. Watkins in Bristol in 1937. In 1954 Grantley C and Eileen F Parsons were listed as living in Flat 1 at the Picture House. In 1958 there were two couples: Horace W and Mary C E Short (in Flat 57A) and Ronald L and Muriel I Wilson (in Flat 57b). Since 1959 the building went through a difficult period. It was not easy to find a suitable alternative use for the cinema. 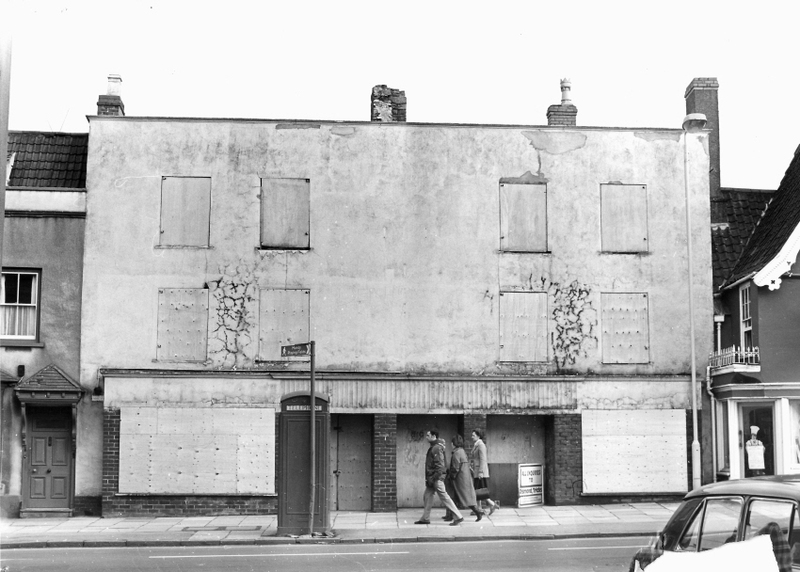 Photographs show that ‘Berkeley Supplies’ used the rooms at the front as a shop. In 1969 the building was used by a firm called ‘Lectex Ltd’. For a long time the building on the High Street was left boarded up looking very forlorn. The auditorium at the rear was pulled down and replaced by a new building housing St Mary’s Surgery. Click on the photo on the right to see a larger image. On September 22nd 1979 The Gazette carried an article referring to a planning application for this property. The application failed because of a lack of information. However the Post Office must have owned the property at this time as the application was to obtain planning permission to demolish the cinema and build a two storey office block so the site could be sold off to developers. Then in the 1980s or early 1990s, the buildings at the front were re-developed into modern offices. Amongst the many occupants of these units have been Halifax Property Services, Besley Hill Estate Agents, Christian Aid, foundation Piling Group and Park Insurance. A plaque commemorating the centenary of the invention of cinema was erected in 1996. This also acknowledged that the cinema was a ‘Grace Family concern for its entire existence 1919 – 1959’.